At first glance, the new E-PACE seems to be aimed squarely at the Porsche Macan. Both vehicles offer far more luxury than the average compact SUV and both are stunning to look at. However, while the Porsche starts at around $48,000, the E-PACE actually has a base price that is some $10,000 less expensive, despite similar power output for both vehicles. The Lexus NX is another good comparison and fits better into the Jaguar's price range, however the NX doesn't come standard with all-wheel drive and while it certainly has aggressive styling, few would argue that it's easier on the eyes than the compact E-PACE. The Jaguar E-PACE comes in two models: P250, and P300 R-Dynamic. The P250 is the entry-level trim, but can be upgraded to S, SE and First Edition trims. The P300 R-Dynamic is the upgrade model and can be had in S, SE and HSE trims. Motivating P250 models is a 2.0L 4-cylinder turbocharged engine making 246 horsepower. Power is sent to all four wheels via a 9-speed automatic transmission. P300 R-Dynamic models are more aggressively tuned and make 296 horsepower. Jaguar claims that the 0-60 sprint can be covered in just 6.6 seconds for the less powerful engine and 5.9 seconds for the more powerful one, making both relatively quick for an SUV. Standard features on the base model E-PACE include LED headlights, heated door mirrors, automatic headlights, rain sensing wipers, 17-inch wheels, 2-zone climate control, a leather steering wheel, a 10-inch touchscreen entertainment system, two USB ports and four 12-volt sockets, Bluetooth connectivity, a rearview camera, parking sensors front and rear and a lane-keep assist system. S trims get 18" 9-spoke wheels, 10-way heated front seats, a park assist system and navigation. SE trims add bigger 19" wheels, a power liftgate, 14-way power front seats and an audiophile audio system by Meridian. The HSE gets even bigger 20" wheels, 18-way power front sport seats and premium "Windsor" leather. R-Dynamic E-PACEs are recognizable by their gloss black grills and unique 18-inch wheels. Standard features on the R-Dynamic model include bigger brakes, gearshift paddles for the steering wheel, an auto-dimming rearview mirror, 10-way powered front seats, a voice-activated navigation system, better smartphone connectivity and a whole host of additional electronic goodies such as adaptive cruise control, blind-spot assist, a 360-degree camera and a rear cross-traffic monitoring system. The First Edition comes feature-laden, with automatic high beams, 20-inch wheels, configurable ambient internal lighting, a suede headliner, 18-way power adjustable heated seats with a memory function, Windsor leather seating surfaces with contrasting red stitching, a 380-watt Meridian sound system with 11 speakers, SiriusXM radio and a heads-up display. Convenience features on the First Edition include even more USB ports, keyless entry and a gesture-controlled rear tailgate. Safety features on the E-PACE include anti-lock brakes, traction control and stability control, along with an emergency brake assist system, full length side curtain airbags, front side airbags and an alarm system. 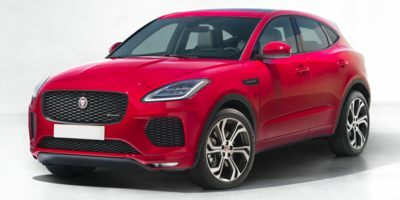 After the grand introduction of the Jaguar E-PACE last year little has changed for 2019. The most significant of changes includes the addition of a "Smartphone Pack" that integrates Apple CarPlay/Android Auto and voice-activated navigation control.